I'm a news junkie. My addiction began during the fall of my senior year at the University of South Carolina. I was heavily immersed in my courses as a journalism major when the September 11 attacks happened. Like most Americans, I became glued to the round-the-clock coverage of this tragic event. Except I never became unglued from the news. I love cable news shows--I watch Morning Joe to start my day, MSNBC and CNN throughout the day (I even check on Fox News), and my evening isn't complete without Countdown with Keith Olbermann. And even though my J-School professors required that we subscribe to the local newspaper and to industry publications like Advertising Age, my love for reading print publications has largely been transferred to reading news stories on the Internet. So I was particularly interested when my editor at Creative Loafing, Carlton Hargro, asked me to write an article about The Charlotte Observer. The idea was to chronicle many of the changes that have occurred at the big O--this recession has caused them to lay off hundreds of workers over the last two years--and to see what kind of daily newspaper we're left with. I was surprised and pleased that both the Observer's publisher, Ann Caulkins, and editor, Rick Thames, agreed to talk to me for the article. It showed their journalistic integrity and respect for the medium that they would agree to be interviewed for an article in the city's alternative weekly. I learned a lot about the Observer during the process of researching and writing this story. Some things I already knew, having friends and colleagues who either work there or used to work there before the layoffs and buyouts, but a lot I didn't know. 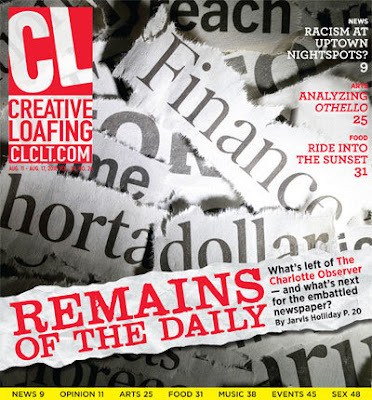 I hope you learn a lot in this week's Creative Loafing cover story, "Remains of the Daily: What's left of — and what's next for — The Charlotte Observer?" The story posted online today, click here, and it hits newsstands tomorrow. Congrats on the cover story!